After all said and done, the end is near for the Big Brother Naija: Double Wahala reality TV show and only five housemates are going head to head to emerge as the winner of the grand prize. In light of this, the five housemates who are potential winners of the Big Brother show are Alex, Cee-C, Miracle, Nina and Tobi – two gentlemen and three ladies vying for the number one spot in the Big Brother Naija game. The last eviction show earlier tonight saw Anto, Khloe and Lolu leave the big brother game leaving five housemates remaining in the Big Brother game and just one more week to go. After their eviction, we saw the voting results and in the usual Fashion, Miracle topped the voting results with a whooping 44.33 percentage of votes, while Cee-C followed suit with a 27.88% votes, Lolu followed closely with 22.23% votes, Anto had 3.67% votes and Khloe came last with a 1.89% vote. With the high percentage of votes on Miracle’s part, it’s obvious that the pilot has a high chance of winning the game but we’ll have to find come next week Sunday. With this, who do you think will be winning the Big Brother game?! 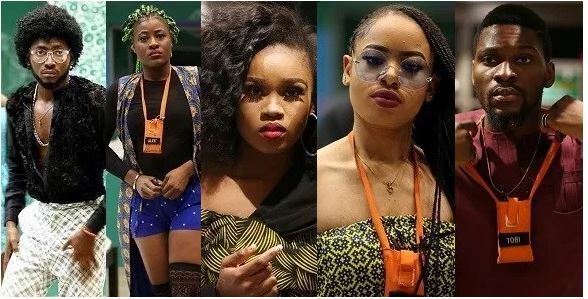 The post Meet The Top Five Finalists Of BBNaija “Double Wahala” Show appeared first on LATEST NIGERIAN NEWS BREAKING HEADLINES NEWSPAPERS.